It’s been six months since Sweet by Nature was penned and released into the ether and in less than a week’s time, my students at the University of Johannesburg (whose work was featured in the article) will submit their Masters projects for external examination. In that time, I’ve not only come to understand better what it is I’m supposed to be teaching them, but also where the potential gaps in the overall structure of architectural education—particularly in Africa—may lie. One such gap has to do with ‘nature’ and specifically what we mean by ‘nature’ when we teach architecture. It may seem like an obvious point but education, even in the context of a semi-vocational/professional course like architecture, isn’t just about the delivery of an ‘approved’ curriculum, it’s also (perhaps more deeply) concerned with the transmission of values. 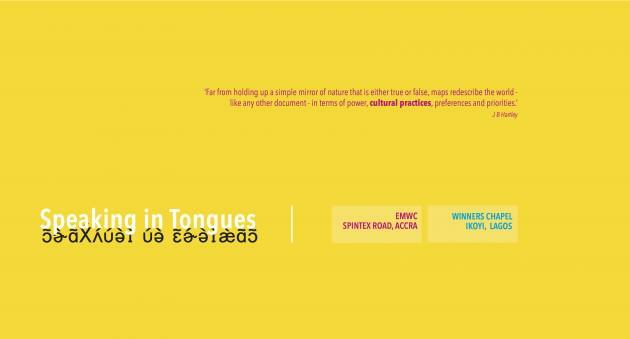 In the context of Africa where the very idea of shared cultural values that transcend the specificities of place, language, history and even ‘race’ remains an elusive pipedream, the question of how we might teach an approach to ‘nature’ and by extension ‘landscape’ remains equally elusive. By and large, African schools of architecture follow curricula handed down/derived or adapted from one colonial context or another—British, French or Portuguese. South Africa’s eight schools have an added Dutch/Afrikaans layer of cultural complexity to contend with, but I believe it’s fair to argue that African schools have yet to attempt the profoundly complex translation of indigenous, pre-European built environment beliefs, rituals and ways of seeing into a functioning modern architectural curriculum. 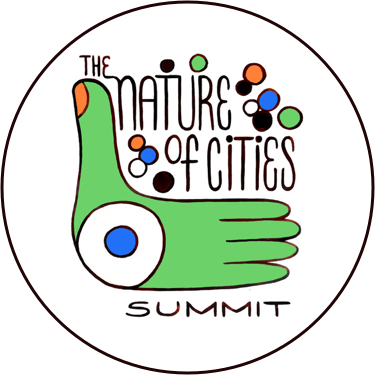 Given the explosive nature (no pun intended) of urbanisation, the question of how we define, explore, protect and appreciate nature and landscape in relation to urban growth is particularly urgent. 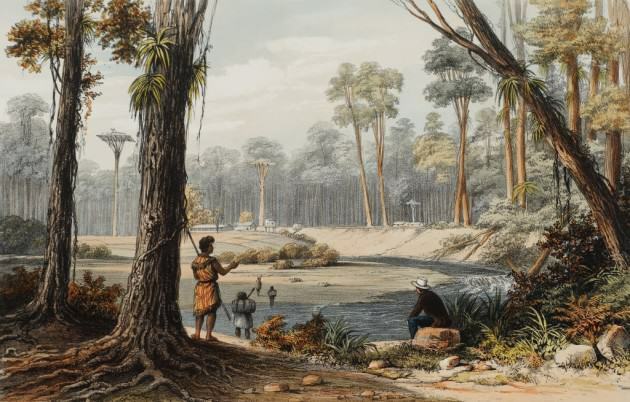 Augustus Earle, Distant View of the Bay of Islands, New Zealand, ca 1826-27, courtesy of National Library of Australia. South African cities, uniquely, can be defined in three quite distinct ways: township, city and suburb, and in each, nature plays a particular role. The leafy northern suburbs of the city constitute the world’s largest man-made urban forest, defined as a collection of trees that grow within a city, town or suburb (note: not township). In its widest sense, it includes any kind of woody plant vegetation growing in and around human settlements. In a narrower sense, it describes an area whose ecosystems are inherited from wilderness ‘leftovers’ or remnants. 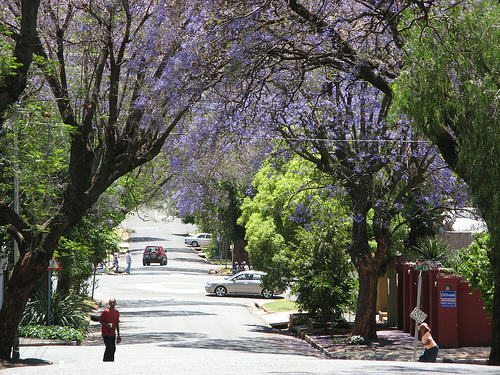 Johannesburg’s Northern Suburbs are said to contain between 6 and 10 million trees, and although the claim is often disputed, Wikipedia says it’s true. Irrespective, as an outsider to Johannesburg in all senses of the word, it’s easy to see why the claim holds such sway. I don’t recall ever being in a city—anywhere—where the difference between two ‘faces’ of the city is quite so stark. Nature here, far from being the gentle pacific force that tempers hard (and often harsh) urban reality, is a weapon that distinguishes one profile from another, softens selectively and purposefully, rams home an insidious, unpalatable truth: nature isn’t for all; only for some. One of the most poignant conversations I’ve had in a long time—anywhere—was held a fortnight ago in Braamfontein, one of the inner city’s up-and-coming regeneration ‘success’ stories. I asked a young black architect what had ‘turned him on’ to architecture (as a possible profession). The Leafy Suburb, 4th Avenue, Melville, Johannesburg. Having watched my students’ projects literally grow over the past six months, the question of drawing has stubbornly remained uppermost in my mind. How to draw? What to draw? What to expect from a drawing? What to explore, what to explain? Coincidentally (although I’m beginning to understand that nothing is coincidental), I’m about to leave for the U.S. to take part in a panel discussion at Washington University, on the pedagogy and practice of drawing and architecture worldwide. 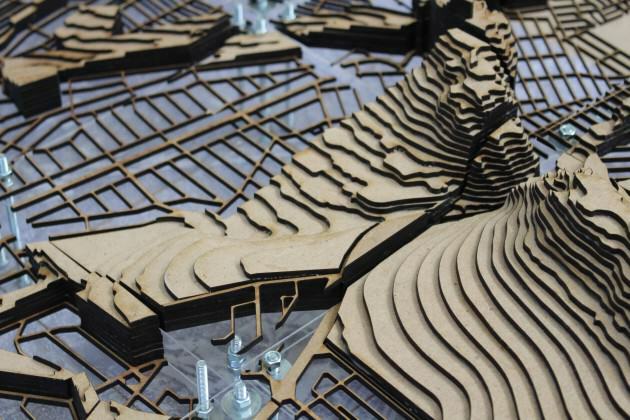 The invitation comes at precisely the right moment: at the University of Johannesburg, a quiet-but-pivotal change is about to take place that connects the department of architecture to the panel discussion in an unexpected way. Organised in conjunction with the exhibition Drawing Ambience: Alvin Boyarsky and the Architectural Association, the Mildred Kemper Lane Art Museum in St Louis will ‘present the first public museum exhibition of architectural drawings from the private collection of the noted educator Alvin Boyarsky. Amassed during Boyarsky’s tenure as chairman of the Architectural Association School of Architecture (AA) in London from 1971 until his death in 1990, the collection features early drawings by some of the most prominent architects practicing today—Frank Gehry, Zaha Hadid, Daniel Libeskind, Rem Koolhaas, and Bernard Tschumi, among many others. Through a selection of approximately forty prints and drawings that constitutes the bulk of this collection, as well as nine limited-edition folios published by the AA—including works by Peter Cook, Coop Himmelblau, and Peter Eisenman—Drawing Ambience offers a rare glimpse into a pivotal moment in architectural history and the imaginative spirit of drawing that was and continues to be instrumental to the development of the field.’. Boyarsky was the architect (no pun intended) of the now-famous Unit System of architectural education, which eschewed the traditional approach to teaching architecture in favour of a radical educational model that is now followed in architecture schools across the world. 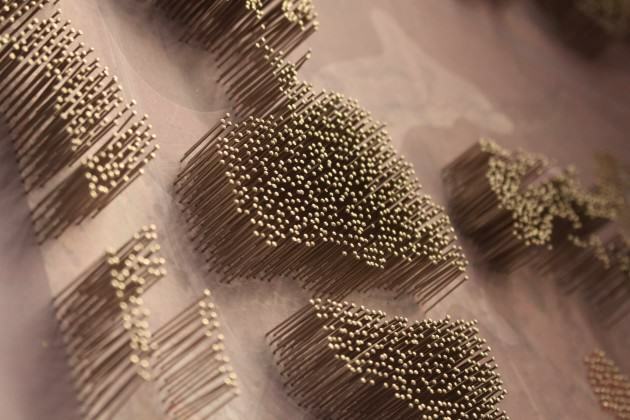 Instead of a standard curriculum, the Architectural Association (AA) allowed tutors to construct their own educational structures, with students free to choose the approach that most interested them. The AA thus heralded the move from modernist orthodoxy to a much more pluralist system. Boyarksy encouraged debate—and sometimes conflict—between the units, so that work was always subjected to a variety of opinions. The AA in the 1970s and 1980s also hosted key architectural lectures and debates, becoming an international hub for the development of architectural discourse. Many of the world’s most famous architects, including Rem Koolhaas and Zaha Hadid, emerged from the intense environment that the AA constructed. 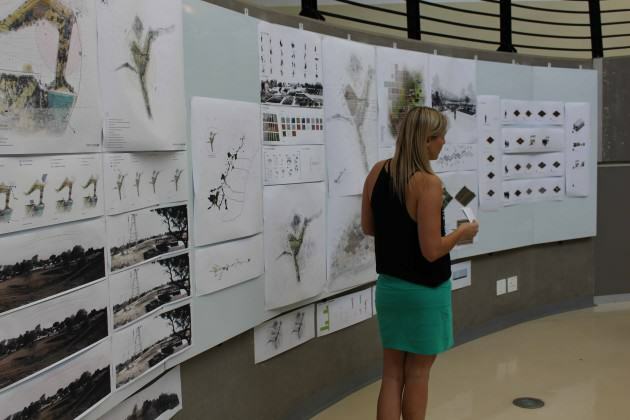 As of February 2015, the University of Johannesburg will be the first school of architecture on the African continent to adopt the Unit System. Central to its success is an approach to drawing that sees the emphasis shift from ‘drawing-as-a-means-of-explanation’ to ‘drawing-as-a-means-of-exploration’. It’s an important distinction but a complex one and in order to make the point more clearly, I’d like to step sideways for a moment, and speak not of drawings but of novels. When the word ‘novel’ entered the languages of Europe, via Don Quixote, considered to be the first European novel, it had the vaguest of meanings. It meant—as its name suggests—something new: a form of writing that was formless, that had no rules; that made up its own rules as it went along. It captured—and represented—the collision of a number of different forces: urbanisation, the spread of printing, the availability of cheap paper, and it began the tradition of an intimate reading experience that has endured to this day. 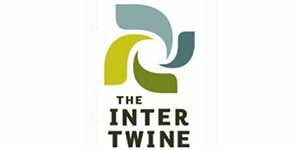 For cultures without the written word—like the majority of African cultures—that relationship between intimacy (the solitary act of reading or drawing) and performance (those aspects of oral storytelling and communal building)—is one that we grapple with—or at least should grapple with—today. Using the drawing as a means of exploring, not explaining, seems to offer African students (and let me only speak about students here, not practitioners or professionals) a way out. For me it represents a real triumph of will—not only in the context of global speculation about architecture and architectural education, but particularly in the context of Africa, which has never ‘deserved’ to be speculative. Too many toilets to be built, too many people to house, too much poverty and chaos, and too many problems for such esoteric speculation: that’s Africa for you. Well, for us. But I’ve never held that view, not even as a student, and I certainly don’t know. There’s a lot of work to be done to reconfigure a curriculum that better serves our needs—and I’m not talking about sanitation upgrades or social housing—but rather that gap in the title of this section between exploration and explanation. For me, the speculative, deeply explorative space of design research begins with a new relationship to, and with, drawing. I don’t know about you—and I certainly don’t know yet about my students—but I’m hugely excited by the possibilities that a new relationship might bring. 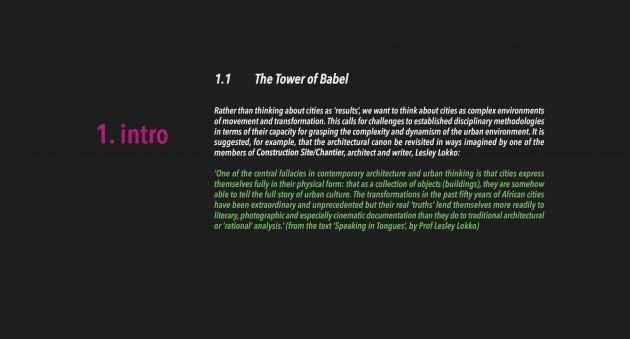 ‘Speaking in Tongues’, from the presentation to Construction Site/Chantier, a research proposal conceived and managed by Pfruender, G. & Kros, C., Johannesburg, forthcoming 2016. Here’s where some of those drawings ‘grew’ to. In many ways, her own drawings are analogies for the unfolding of her design: sub- and often unconscious, intuitive, expressive and sometimes ‘blind’, she has allowed a different language to enter the design process: in place of certainty and precision, she has made room for doubt, for accidental discoveries—a different technique, a particular quality of light, for example. Drawings that are literally full of the ‘small pleasures’ she sought to express. In an even dreamier, drift-like and alliterative way, Tiffany eschewed the conventions of plan, section and elevation to allow a different built proposition to emerge. This is a project driven largely by intangibles: sight, sound, smell. 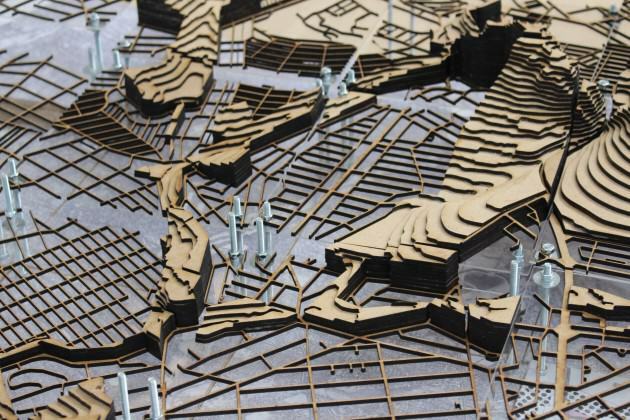 At one level, the entire proposal is a route—through rituals, gardens, landscape and even the city. Frangipani plants sit next to mint: the combination of specific scents is intended to evoke specific memories. A stone wall becomes mossy over time; plants creep and curl their way around latticed screens, providing a dappled roof in Johannesburg’s high, sunny winter. You walk the drawings (some are up to 2m in length) in the same way you might walk through the site. There’s a clear relationship in Tiffany’s work between the site that exists out there, in the ‘real’ world and the site of her imagination: through these beautifully expressive drawings, she manages to pull the two ever closer together. These drawings represent a radical departure from the conventional black lines-on-white paper that Gabi began the year with: burning, scoring, tracing, cutting, lacerating—these have become as much a part of her architectural ‘vocabulary’ as any CAD-generated section might once have, and the project is all the richer for it. ‘Average’ students typically take up half a room at project’s end: Zoë takes up two rooms, possibly more. This year, she has moved between model-making, conventional drawings, landscape urbanism, videos, montages, collages, city council meetings and texts to produce a body of work that is both astonishingly thoughtful and thorough, no mean feat. Using scale as a means to organise her thinking processes and her representational choices (from regional through metropolitan to the neighbourhood and architectural scales), she has managed to extract a way of working—modeling, filming, mapping, planning, envisioning—that not only serves the four scales of her project exceptionally well, it has driven her design decisions: a cycle-in cinema; an allotment farm and market; a ‘kinetic’ forest that is at once landscape, art and education facility. Although Wayne’s work wasn’t featured in my original post, in some ways, his ‘journey’ from convention to experimentation has been the most impressive. A former engineering student, in whose work traces of the impulse to structure, order, explain and classify can still be seen, he has learned to move sideways into slippery, unfamiliar and intuitive territory, allowing the drawing to ‘lead’ him, sometimes against his own will, towards an even more precise resolution of ideas than he might otherwise have thought possible. His chosen site was an abandoned power station just outside Soweto: in a moment of almost Biblical calumny, halfway through the year the ruined power station collapsed as a result of illegal salvage operations: a metaphor for his own way of working. Phoenix-like, a new project has emerged, playful, dextrous and powerful at the same time, with a lightness of touch that surprises everyone who sees it. 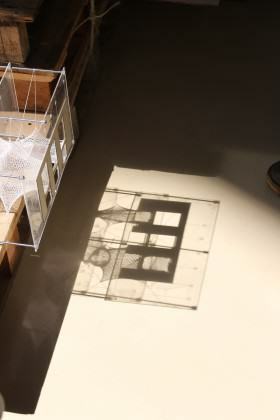 In this image taken during his final presentation, a ray of light pierced the examination room, casting a perfect shadow on the ground. A photograph led to a new drawing, which in turn led to a new model—the perfect synthesis of time, chance and place. It’s hard to summarise a work that is still in progress: these five projects remain a snapshot of a desire that is still partially unfulfilled. In many ways, they have come about through acts of resistance: to convention, to orthodoxy, to established norms and expectations. They express (albeit tentatively) a desire to move beyond a known language into another, more ambiguous realm, neatly sidestepping the dilemma I sketched out earlier: the impossibility of being interpreter and explorer in one. There’s a gap here, as I have already said, but the role of the school (the educator, the pedagogue) isn’t to fill it, or to answer ready-made questions. In my view, at least, our role is to protect and cherish that gap, so that the tentative propositions put forward through new ways of working/seeing/drawing and thinking will have acquired the maturity and sophistication of genuine knowledge, not open-ended, self-absorbed exploration. Mind the gap. 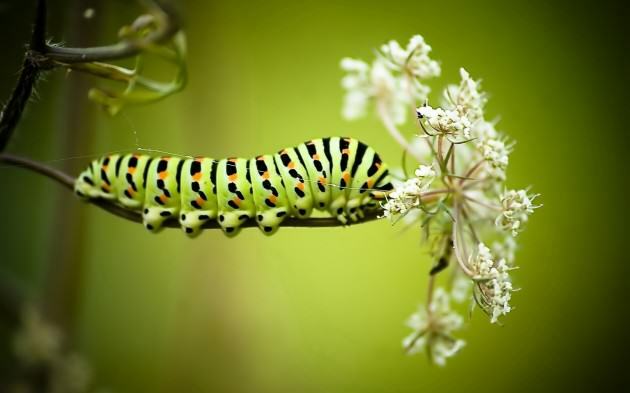 Caterpillars too have their own persuasive beauty. Just saying. Lesley Lokko is an architect, academic and the author of eight best-selling novels, which have been translated in fifteen languages. For over a decade, she has juggled two very different careers simultaneously, though not always smoothly. LESLEY LOKKO is an architect, academic and the author of eight best-selling novels. She studied at the Bartlett School of Architecture and Planning, University College London, graduating in 1995 with a BSc(Arch) and DipArch, before going on to gain her PhD from the University of London in 2007. 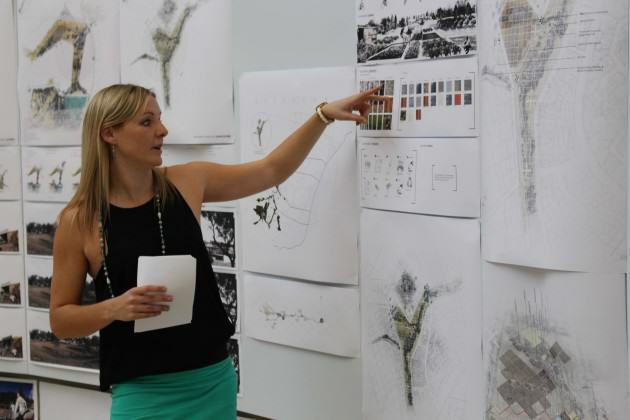 She has taught a numerous schools of architecture in the US (Iowa State University and the University of Illinois at Chicago); the UK (Bartlett School of Architecture, Kingston University, London Metropolitan University and the University of Greenwich), as well as South Africa, where she was Visiting African Scholar at the University of Cape Town. She was the Martin Luther King Visiting Professor of Architecture at the University of Michigan and has, since 2004, been Visiting Professor at the University of Westminster. In 2000, she edited White Papers, Black Marks: Race, Culture, Architecture (University of Minnesota Press, 2000) and since then, has ben an on-going contributor to discourses around identity, race, African urbanism and the speculative nature of African architectural space and practice. She was a founding member of ThirdSpace, a UK-based collective that researched the relationship between architecture, globalisation and cultural identity, and was a co-founder of the current MArch programme at the University of Westminster, Architecture, Cultural Identity and Globalisation (MACIG). 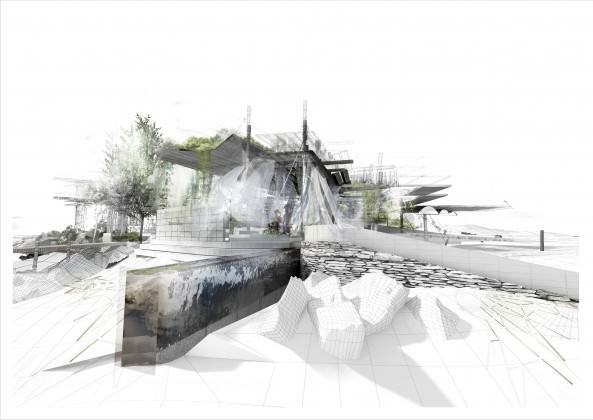 She is an active participant in the UCT-funded Centre for the Study of African Cities, and is a regular juror at international competitions and symposia, most recently at EUROPAN (Vienna 2009); Blueprints of Paradise (Amsterdam 2012) and ArchiPRIX International (Moscow 2013). In 2004, she made the successful transition from academic to novelist with the publication of her first novel, Sundowners (Orion 2004), a UK-Guardian top forty best-seller, and has since then followed with eight further best-sellers, which have been translated in fifteen languages. For over a decade, she has juggled two very different careers simultaneously, though not always smoothly. Oops. Thanks Tim. I stand corrected—I got confused by the orange vs. yellow spots. Most enlightening! Now I understand where you are coming from – or going, I should say, especially in the context of our discussion at Stanley 44. I hereby declare my commitment to assist in the Masters Unit system next year. I trust my passion for ballpoint pen drawing; thinking through drawing, design and craft will provide a creative platform for students to realize, visualize and launch their creative concepts and ideas in finding design solutions in practice. Differentiating it from anise swallowtail by recognition of the larval plant ? Reiko thinks it looks like a carrot, parsnip family plant but can’t make the call one way or another. Or is it the coloring of the wiggler that makes it a clear call?